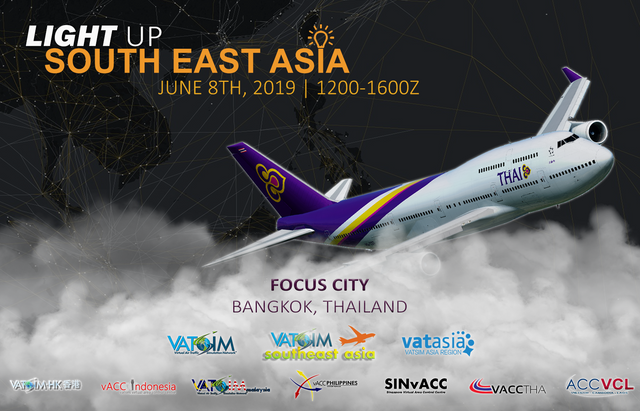 VATSIM South East Asia Division is proud to present our first ever division-scaled event, Light Up South East Asia! Spanning across 13 FIRs, we aim to provide top-down ATC services within each country’s capital. During the 4-hour event, we warmly invite pilots to fly into and out of our focus city to the other capital cities in the division. Light Up South East Asia will be held twice a year. For the first light up in 2019, we will be focusing on the city of Bangkok, Thailand. Known for its culture and food, join us on 8th June from 1200-1600Z as we show you our hospitality.